"WE HAVE OWNED this jeep about 5 years now. We knew about this jeep for several years prior to our owning it. When our friend sold it, we lost track of it for about 4 years. One day on the way back home while following a detour because of road construction, we came across it again for sale in a farmer's front yard. We negotiated a purchase for little more than our friend had sold it. The new owner had rebuilt the engine and many other improvements. When I got it home I removed a homemade cab and snowplow and proceeded to convert it to a WWII MB look-alike. I installed an MB grill and bows and brackets on the body. An MB windshield and fuel can and spare tire holder were also installed, but I saved all the CJ parts. 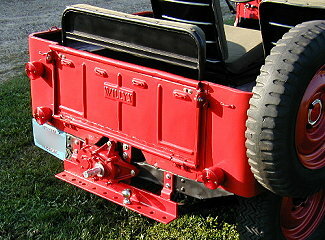 We did this because I had not finished my ground up restoration on my 1941 MB slatgrill. I finally decided to put it back to a CJ after we got a 1942 Ford GPW which we needed the military jeep parts to complete it. So I replaced all the military parts with the civilian parts after repairing them. I welded up many drilled holes in the body and tailgate prior to paint. 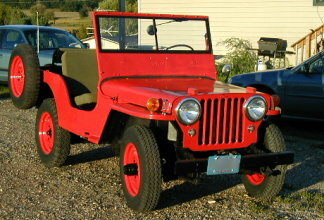 The PTO came from a recently purchased 1945 CJ2A chassis. 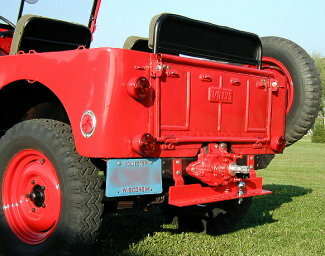 This jeep's original color was Luzon Red as seen on the color chips elsewhere on this site but I chose an implement color because of easy availability. Nice job, Tim and Sue!